The Land of Eden was the name William Byrd II gave to his 20,000-acre grant in the Dan River Valley in North Carolina. 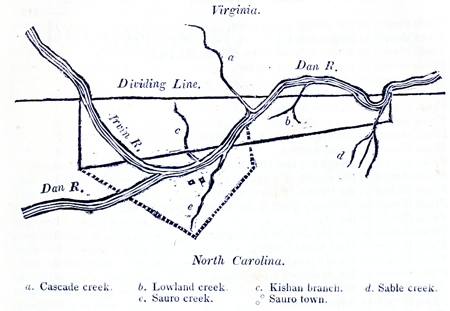 Byrd acquired the land as a result of surveying the North Carolina-Virginia boundary line in 1728. He made a second expedition to the region in 1733 to survey his vast tract, describing this trip to the Carolina backcountry in A Journey to the Land of Eden. As surveyed, the tract lay in present-day Caswell and Rockingham Counties, the bulk located in the northeast corner of the latter. In 1742 Byrd purchased 6,000 additional acres adjoining the southwest side of the grant. Although he hoped to attract settlers to his Carolina lands and continually sought to promote them, his efforts never succeeded. Byrd's son William Byrd III inherited the estate, but to satisfy debts he sold it in 1755 to Francis and Simon Farley, merchants from Antigua. Francis's son, James Parke Farley, came to the Dan River in 1769 to manage the plantation. Two years later he married Elizabeth, the daughter of William Byrd III. The Farleys returned to Virginia on the eve of the American Revolution. After Farley's death, the estate was in litigation, and the plantation was divided into seventeen tracts and sold in 1803. The name is perpetuated by the city of Eden, which is located in Rockingham County on the western border of the original grant. Lindley S. Butler, Rockingham County: A Brief History (1982). Byrd, William. The Westover manuscripts: containing the history of the dividing line betwixt Virginia and North Carolina; A journey to the land of Eden, A.D. 1733; and A progress to the mines. Petersburg: Edmund and Julian C. Ruffin. 1841. http://archive.org/stream/westovermanuscr00byrd#page/102/mode/2up (accessed August 24, 2012). Rodenbough, Charles. History of a Dream Deferred, William Byrd’s Land of Eden. Raleigh, N.C.:Lulu.com. 2009. Byrd, William. "My plat of twenty thousand acres in North Carolina." The Westover manuscripts: containing the history of the dividing line betwixt Virginia and North Carolina; A journey to the land of Eden, A.D. 1733; and A progress to the mines. Petersburg: Edmund and Julian C. Ruffin. 1841. p.121. http://archive.org/stream/westovermanuscr00byrd#page/102/mode/2up (accessed August 24, 2012).